A spelling error can ruin the effect of even a well-designed document. 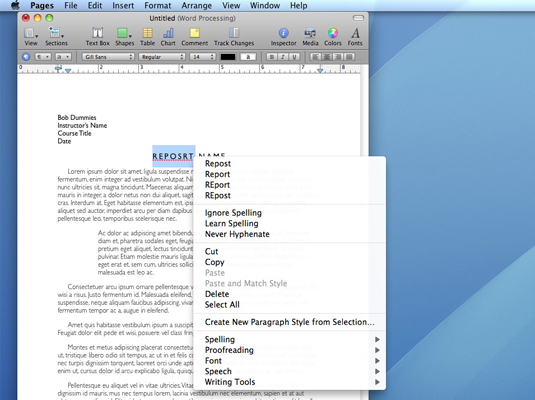 Pages — the Mac OS X Snow Leopard desktop publishing application — can check spelling as you type (the default setting) or check it after you complete your document. If you find automatic spell-checking distracting, you should definitely pick the latter method. Click Edit and hover the mouse cursor over the Spelling menu item. Click Check Spelling As You Type. If a possible misspelling is found, Pages underlines the word with a red, dashed line. Right-click the word to choose a possible correct spelling from the list, or you can ignore the word if it’s spelled correctly. 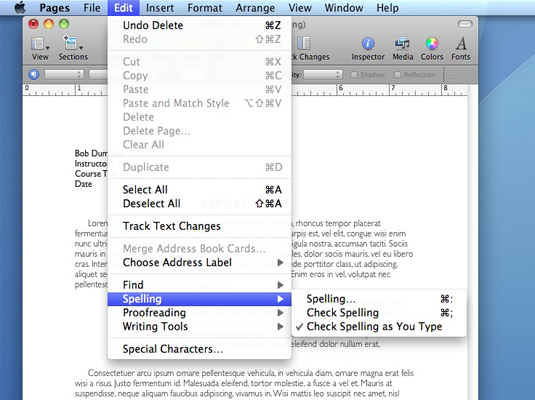 To turn off automatic spell checking, click the Check Spelling As You Type menu item again to deselect it. Click within the document to place the text insertion cursor where the spell check should begin. Click Edit and hover the mouse cursor over the Spelling menu item; then choose Check Spelling. Right-click any possible misspellings and choose the correct spelling, or choose Ignore if the word is spelled correctly.